Ramsbury is a village and civil parish in the English county of Wiltshire. The village is in the Kennet Valley near the Berkshire boundary. The nearest towns are Hungerford about 4.5 miles (7.2 km) east and Marlborough about 5.5 miles (8.9 km) west. 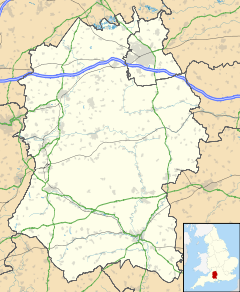 The much larger town of Swindon is about 12 miles (19 km) to the north. The civil parish includes the hamlet of Axford about 2.5 miles (4.0 km) west of Ramsbury, and three smaller hamlets: New Town, close to Ramsbury to the southeast, and Knighton and Whittonditch, both about 1 mile (1.6 km) to the east. The 2011 Census recorded a parish population of 1,989. Littlecote Roman Villa is in the parish. The earliest written history of Ramsbury can be traced from the Saxon era when the bishopric of Ramsbury was created in 909 AD. The see was moved to Old Sarum in 1075. Church of England parish church of the Holy Cross dates from the 13th century. It has a ghost story: according to local legend, if you count the hundred studs on the north door at midnight, it will open, and the ghost of 'Wild' William Darrell of Littlecote House will come out. During the Second World War there was a Royal Air Force airfield on a ridge of high ground to the south of the village. In Saxon times, Ramsbury was an important location for the Church, and several of its early bishops went on to become Archbishops of Canterbury. The episcopal see of Ramsbury was created in AD 909 when Wiltshire and Berkshire were taken from the bishopric of Winchester to form the new diocese of Ramsbury. It was occasionally referred to as the bishopric of Ramsbury and Sonning. In 1058 it was joined with the bishopric of Sherborne to form the diocese of Sarum (Salisbury), and the see was translated to Old Sarum in 1075. Although no longer a diocesan see, the bishopric of Ramsbury is now an episcopal title used by a suffragan bishop of the Church of England Diocese of Salisbury (see Bishop of Ramsbury), and is included in the Catholic Church's list of titular sees. 927 942 Oda of Canterbury Translated to Canterbury in 942. 985 990 Sigeric the Serious Translated to Canterbury in 990. 990 995 Ælfric of Abingdon Translated to Canterbury in 995. 1045 1075 Herman In exile from 1055–1058 (when the see was administered by Ealdred, Bishop of Worcester). Also Bishop of Sherborne from 1058. Ramsbury has an elected parish council and also falls within the area of the new Wiltshire Council unitary authority, which is responsible for all of the most significant local government services. Throughout the Middle Ages, Ramsbury traditionally held two annual fairs – a livestock fair ("Cattle Fair") in the spring, and a hiring fair or "Mop Fair" at Michaelmas. Nearby Marlborough's tradition of holding one Mop each side of Michaelmas ("Little Mop" on the Saturday before and "Big Mop" on the Saturday after), was originally a means to accommodate the (then) more prestigious Ramsbury Mop. By the 19th century, both fairs had become Cattle Fairs. The spring Cattle Fair (traditionally held on 14 May) finally ceased in 1939. The Michaelmas Fair slowly lost its original agricultural connections, becoming purely a funfair in 1946 before finally ceasing in the 1950s. An annual carnival was instituted to replace the Fairs and survived until the 1990s but has in turn been replaced with a biennial Street Fair which sees the High Street closed from the Square to the Memorial Hall. The Provident Union Investment Society was founded in Ramsbury 1846, becoming the Ramsbury Building Society in 1928. It was headquartered in the Square until 1982 and took as its logo the ancient wych-elm which grew immediately opposite. Subsequent mergers saw the Building Society being subsumed into the Regency and West of England Building Society, then the Portman Building Society, and finally the Nationwide Building Society. For centuries, Ramsbury was famous for its Tree  – a large wych-elm which stood in the Square at the heart of the village. The Tree was first mentioned in a report in 1751, by which time it must have already been well established. In its prime, its spread was said to have touched the buildings on all sides of the Square. Photographs from the early 20th century show the Tree in apparently fine health, although perhaps reduced from its former size. But, by the 1920s, the Tree was in noticeable decline. It gradually succumbed to old age, eventually dying in 1983 by which time it would have been well over 230 years old. The gnarled stump remained in the Square for several years while a replacement was discussed. Many villagers wanted to keep the old Tree, dead or not, where it had stood for so many centuries. However, after a referendum which threatened to split the village, it was eventually agreed that it should be replaced. Over the course of the second half of the 20th century, Dutch Elm disease had ravaged the native populations of elm species and so an oak sapling (sponsored by Portman Building Society) was sourced from Epping Forest and planted to replace the old Tree. Local people are known as Ramsbury Bulldogs, contrasting with the neighbouring village of Aldbourne, where the locals are known as Dabchicks. The village's notable residents have included Sir Francis Burdett (1770–1844), a radical Whig politician, and his daughter Angela Burdett-Coutts. In 1837 Angela became the richest woman in England when she inherited her grandfather's fortune. Over several years she gave most of this money away to good causes. By the time she died in 1906, Angela Burdett-Coutts had given away nearly three million pounds. Both lived in Ramsbury Manor, originally built in the 1680s by Dr Robert Hooke, the scientist and architect, for Sir William Jones. Ramsbury Manor was stated by the 1966 Guinness Book of Records to have been the "most expensive" house in Britain, bought by an American property dealer in May 1965 for £275,000, in total with its 460 acres of land, for £650,000. More recently, it has been the home of Harry Hyams, the property tycoon who built the office block Centre Point at the junction of Tottenham Court Road and Oxford Street, London. The Manor was the target for a major burglary by a professional gang in 2006. The culprits received long prison sentences in 2008. Stefan Persson, the owner of H&M, also has a main residence on the outskirts of Ramsbury. He also owns the Ramsbury microbrewery which brews Ramsbury Gold bottled beer amongst others. Composer David Fanshawe lived near Ramsbury until his death in July 2010. Peter Holdsworth established a pottery in the village in 1945, producing pottery in the "English studio" style until his death in 1967. His widow continued the business for several years afterwards. There are two pubs situated in Ramsbury: The Bell on the Square and the Crown and Anchor on the corner of Crowood Lane and Oxford Street, as well as the Royal British Legion’s branch on the High Street. In addition to the Ramsbury Brewery, Distillery and Smokehouse, several other notable local food and drink producers are based in Ramsbury. The Ramsbury Tea Company, in particular, has won several national awards. ^ a b "Wiltshire Community History – Census". Wiltshire Council. Retrieved 4 September 2014. ^ Rice, Douglas Walthew. The life and achievements of Sir John Popham, 1531–1607 : leading to the establishment of the first English colony in New England. Madison, New Jersey: Fairleigh Dickinson University Press. p. 90. ^ Crockford's Clerical Directory (100th ed.). London: Church House Publishing. 2007. p. 948. ISBN 978-0-7151-1030-0. ^ Annuario Pontificio 2013. Vatican City: Libreria Editrice Vaticana. 2013. p. 957. ISBN 978-88-209-9070-1. ^ "Catholic Saints". Retrieved 12 March 2018. ^ "Ramsbury Raven". Retrieved 12 March 2018. ^ "Ramsbury Parish Council". Retrieved 13 March 2013. ^ "BBC news report 6 August 2008 – five jailed for biggest burglary". BBC News. 6 August 2008. Retrieved 5 October 2008. ^ Jones, Sam (7 August 2008). "The Guardian 7 August 2008 – After 20 years, five police forces and £80m in loot, Britain's biggest crime family brought to justice". London. Retrieved 5 October 2008. ^ "Ramsbury Microbrewery Official Site". Retrieved 15 September 2008. ^ "Ramsbury Tea". Retrieved 30 July 2013. Pevsner, Nikolaus; Cherry, Bridget (revision) (1975) . Wiltshire. The Buildings of England. Harmondsworth: Penguin Books. pp. 377–381. ISBN 0 14 071026 4. Wikimedia Commons has media related to Ramsbury. This page was last edited on 10 January 2019, at 20:08 (UTC).